Located in the main lobby of the Spa at Norwich Inn, Ascot's is the embodiment of a classic pub in a New England country inn. 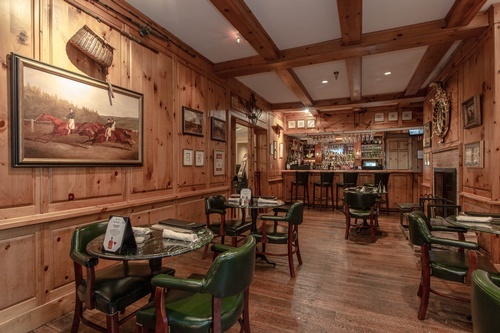 Sit in front of a roaring fire, or simply relax at our knotty pine bar with its collection of hunting prints and antique sports equipment. Ascot's serves drinks and lighter fare, complementing Kensington's full restaurant menu. Ascot's features a full bar, 23 kinds of beers, including locals and microbrews, cocktails menu and new pub food menu items like ''Steak Frites,'' Build-A-Burger, Yankee Chili, Fried Calimari and Buffalo Chicken Spring Rolls. Live music, food and drink specials Thursday evenings, too!